The Senegalese Ligue 1 2013 will kick off this weekend. In this post, I will present transfer information and squad information. 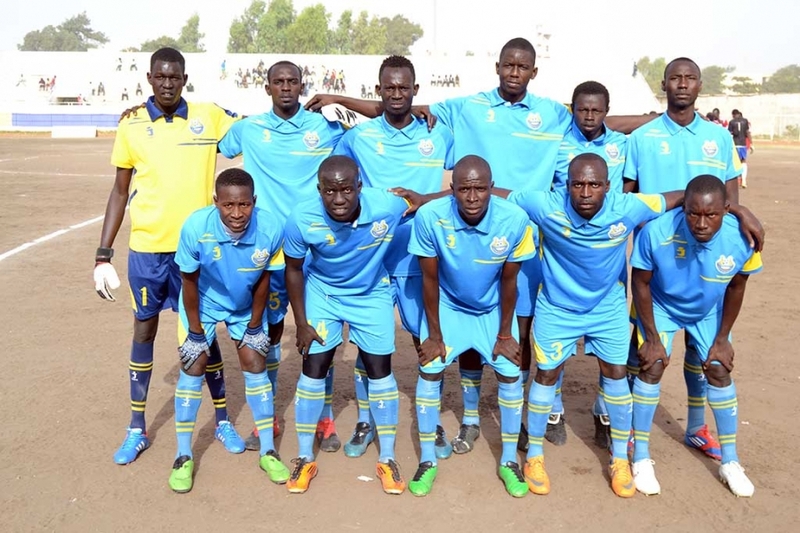 The picture, found on www.guediawayefc.com, shows players of Guédiawaye FC, one of the dark horses of the season. Casa Sport, based in Ziguinchor, won the Senegalese Ligue 1 2011-2012 and will be hoping for another successful campaign. Several interesting players have joined the ambitious club. Abdoulaye Seck, who captained Touré Kunda last season, is one of the most promising centre-backs in the league. Pape Amadou Touré (born 24.12.1991) will fight for the left-back spot. Touré, primarily known for his four seasons at ASC Diaraf, played for Touré Kunda in 2011-2012. Ismaïla Niang, a defensive midfielder, joins from ASC Diaraf. Up front, Casa Sport has strenghtened their squad by signing powerful striker Mouhamadou Moustapha Ndiaye (born 05.04.1988) from AS Pikine, Lamine Fanné from Touré Kunda and Ousmane Gassama from Racing Club de Dakar. Gassama, formerly of the Senegal B and the Senegal U-23 national football team, is particularly interesting. Ndiaye, who scored only one goal for AS Pikine last season, is often referred to as “Davala”. As far as I know, lanky youngster Ibrahima Dramé (born 25.09.1995) will play for Casa Sport this season. Dramé, who is on the radar of Norwegian club SK Brann, is a product of the prestigous Aspire Academy in Qatar. On 15.12.2012, the Gambia B national football team drew 1-1 against Angola in an international friendly match. Gambia’s goalscorer, an attacker called Saloum Faal (born 02.11.1995), has apparently joined Casa Sport from Gambia Ports Authority. You can follow Casa Sport through their Facebook-page: www.facebook.com/pages/CASA-SPORT-DE-ZIGUINCHOR/119973221416081. The local newspaper is also a good source of information: www.scoopsdeziguinchor.com. Dakar Université Club, often referred to as DUC, has been called “the eternal outsider” of Senegalese football. Before the current season, DUC has signed strikers Ameth Diallo, a fringe player at ASC La Linguère, Mouhamadou Dramé, formerly of US Gorée, and Landing Sané Diatta, formerly of Casa Sport. DUC will miss attacking midfielder Jean Remy Bocande, who joined US Gorée. Look out for midfield general Famara Mané (born 02.02.1991), presented in this video: http://www.youtube.com/watch?v=io0njny_kBM. Mané is the brother of Ousmane Mané, the goalkeeper of the Diambars Academy and the Senegal national football team. As always, the Diambars Institute wants to develop their own players instead of signing players from others. This season, I predict a breakthrough for young attacker Dame Gueye, a member of the Senegal U-20 national football team. ASC Diaraf has signed top-rated goalkeeper Khadim Ndiaye (born 05.04.1985) and Samba Gueye (born 04.01.1985), the experienced centre-back, from ASC La Linguère. The squad of ASC Diaraf is currently unknown. AS Douanes has apparently lost key midfielder Mamadou Dieye to ASC Niary Tally and he will be sorely missed if this transfer has taken place. Besides this, it is difficult to find information about transfers. It is difficult to find information about US Gorée and its players. Playmaker Jean Remy Bocande has joined from DUC and I expect Bocande and promising midfielder Roger Gomis (born 05.09.1994) to be key players. Guédiawaye FC is an ambitious side who has made several smart signings before the new season. Full-back Abdourahmane Diop from US Gorée is an experienced campaigner. Ibra Ndiaye, a defensive midfielder formerly of US Gorée and CSS Richard-Toll, could become a key player. Up-front, top striker Mouhamadou Dieng (born 01.01.1985) will have support from Moustapha Mendy (born 06.05.1986), who failed to break through at US Ouakam, and Ousmane Hanne (born 14.06.1989), who played for CSS Richard-Toll last season. Watch out for talented left-winger William Mendy. I would also like to recommend the excellent homepage of GFC: http://www.guediawayefc.com. Apparently, Ibrahim Dermé, the striker from Burkina Faso, and key midfielder Madiop Ndiaye have also left the club. AS Niary Tally has signed two interesting attacking players from Casa Sport; Alouise Thiaw and Mamadou Diatta Ndiaye. Ferdinand Gomis (born 31.03,1984) from CSS Richard-Toll will strenghten the defence. Defensive midfielder Vito Badiane (born 02.06.1986) failed to shine at ASC Diaraf but is a quality player. The striking pair of Alphonse Ba and Abdoulaye Ndao is very interesting. The star player of newly promoted Olympique de Ngor is playmaker Arthur Yannick Gomis, formerly of the Senegal U-23 national football team. According to unconfirmed sources, Olympique de Ngor has signed Cherif Ousmane Sarr from Hassania d’Agadir in Morocco. Central defender Alpha Ba (born 31.12.1989) returns to USO after a stint in Belgium and is a massive signing. I predict a good season for top striker Baye Oumar Niasse (born 18.04.1990), who failed to break through at SK Brann (Norway). AS Pikine is another ambitious side, clearly shown through the signing of three players from ASC La Linguère: right-back Habib Diop (born 02.08.1989), playmaker Moussa Dembélé (born 28.11.1986) and striker Sérigne Cheikh Diouck (born 03.12.1990). Left-back Pape Modou Ndiaye (born 02.11.1991) from US Ouakam and midfielder Thierno Makhtar Thioune (born 10.10.1989) are also great signings. Newly promoted Port de Dakar, also known as ASC Cite Port, has apparently signed Abdoulaye Badiane, an attacking midfielder from AS Pikine. According to unconfirmed sources, CSS Richard-Toll has changed name to “ASSUR”. The club has lost several key players, including El Hadj Maodo Malick Beye (Guédiawaye FC), Ferdinand Gomis (ASC Niary Tally) and Ousmane Hanne (Guédiawaye FC). The squad of CSS is currently unknown. Right-back Blaise Mingou (born 03.03.1991) from Casa Sport, midfielder Mame Birame Gaye from AS Douanes and striker Benoit Toupane from AS Douanes are three interesting newcomers at Touré Kunda. Apparently, the club has also signed attacker Cheikh Ndiaye from DUC. It is difficult to find information about relegation candidates YEGGO. I know that defender Youssoupha Koné has joined from DUC but the rest of the squad is currently unknown. Thank you so much for the updates and insights on the championnat du Senegal. Keep it coming! Do you follow the league exclusively through media or do you sometimes watch the games as well? Great preview! I didn’t know about Ndiaye’s move to Jaraaf, that’s a great signing for Abdoulaye Sarr. Casa Sport are my favorites for the title!